This was actually a really sad day for me. My Uncle Pat had passed away very early in the morning, surrounded by many of my family members in the hospital. 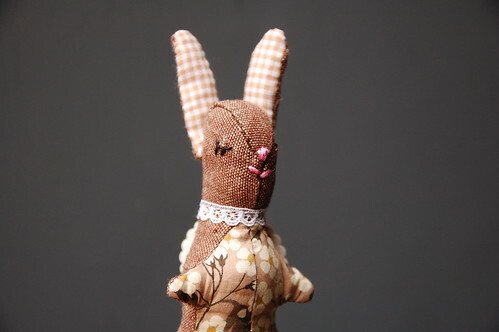 I went to Quilt Sunday for some crafty comfort and dear Claire gave me this darling bunny gift. The timing couldn’t have been more perfect. I’ve named her, ‘Cottontail’, from one of my favourite stories, “Peter Rabbit”. Her tail is actually felted wool, but I think this is okay. Thank you, Claire! This bunny is very special to me. Claire will be at the Spring Trunk Show this Sunday. Cross your fingers that she’ll be bringing some more bunny friends! My condolences as well. I’m glad that the workroom and crafting with friends brings you comfort.